My dog Marley is my best friend. She's a rescue dog and a mix of breeds, possibly lab and hound, and like me, she loves the water. She'll leap into backyard pools without thinking twice even though her swimming skills could be improved (she has a hard time keeping her mouth completely out of the water and usually inhales water as she swims and then coughs and hacks it up once she's out of the water). Because she is both excited to swim, and not so great at it for long periods of time I knew I needed a dog PFD on her if I ever took her out on the SUP with me. I didn't want her jumping off in the middle of the lake and not being able to make it back to shore. 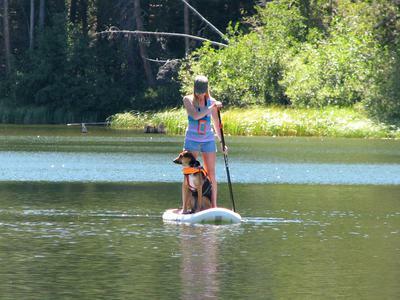 Once we had our canine PFD I was still nervous about SUPing with her because our first chance was on a vacation to the mountains where the lakes were very cold. I really did not want to end up falling in! My excitement finally won over my fear when I was getting ready to SUP and Marley ran over and eagerly got on the board with no coaxing. So we put the PFD on her and off we went with me on my knees and her sitting squarely between my legs. As much as Marley loves swimming, I think she could sense my nervousness and hardly moved at all while we were paddling. I was even able to stand up and never lose my balance. Marley is a 60 pound dog and my Tower iSUP is only 9'6" so I was concerned if she walked around on the board I would lose my balance. Luckily Marley stayed put and we were able to paddle around the lake without incident. 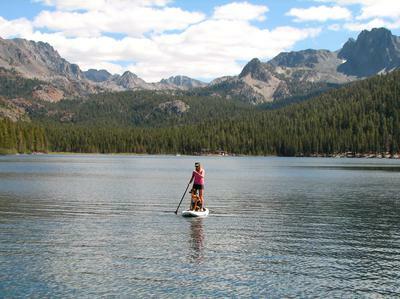 I'm looking forward to being able to SUP with her again over warmer waters where we can be a little more adventurous! Kathy, I'll let you know. Its hard because the lake I usually paddle here in the desert has a no dog rule at the beach where I usually put my board in. That's too bad, because that would be the perfect place to try it with her (the waters are 80+ degrees right now!). By the way, my Tower board is very stable for it's length. My brother in law is probably around 6'2 and 200 pounds and he told me it was a lot more stable for him than the longer boards he had rented in the past. It's quite wide (32" so that helps). My only complaint about the Tower board is that is that I sometimes can't keep up with my paddle group because compared to their hard boards it is a bit slow. I can do a 18-20 minute mile on it when I'm trying hard, where my friends are doing between 13 and 16 minute miles. If you paddle by yourself though you won't notice it. 60lb. of pup + owner on a 9' 6" inflatable board – impressive. 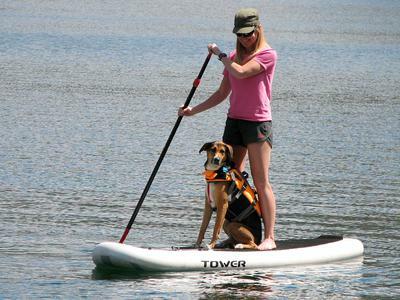 It would be interesting to hear follow-up comments from you on paddling with Marley when she gets used to SUPing. Especially if she starts moving on the board. After all, that much extra weight on a short board is impressive. I've been eyeing that Tower board for a while. This story is very telling when it comes to the buoyancy of the board. 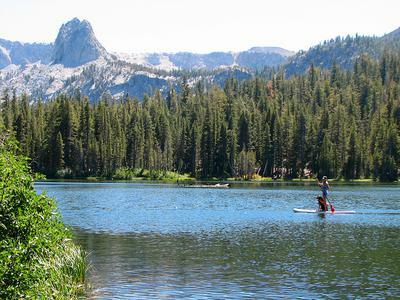 Wow, what beautiful waters you get to SUP on!